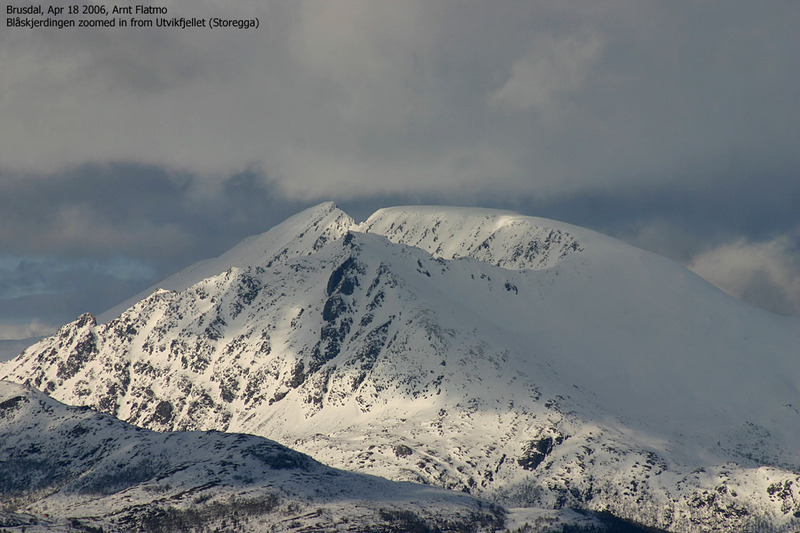 Blåskjerdingen is the highest mountain in Haram kommune and dominates (together with the Trolltinden/Ytstetinden/Remmemstinden massif) the region between E39 (Ålesund - Moldefjorden) and the coastline. The mountain consists of two main tops; Blåskjerdingen (the high point - 1069m) and Skjerdingen (1061m, where the main cairn is located). The pass between the tops require a good head for heights and a rope should be used if the mountain is wet or slippery. Blåskjerdingen is for the most part reached from Rekdalssætra or Eikesætra, while a "F" (Fjelltrimmen) marked route to Skjerdingen runs from Krogsætra in Vatnedalen. Tindfjellet can be reached via the (straightforward) south ridge or from Vestrefjorden via the north ridge. 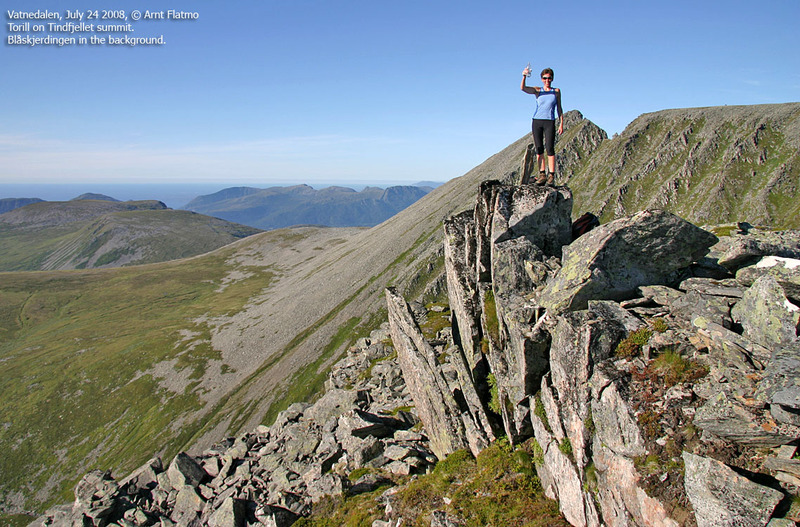 The north ridge is strenuous, and should only be attempted by experienced hikers. The north ridge also has a difficult section where most hikers need find a way around. The views are tremendous; you see the ocean, coastal mountains, long fjords and "countless" wild and sharp peaks, spread across the Nordmøre, Romsdalen and Sunnmøre regions. Blåskjerdingen is, despite being above 1000m high, a very popular mountain. This page will describe new routes to the tops on the Blåskjerdingen massif, as soon as I get to know them. 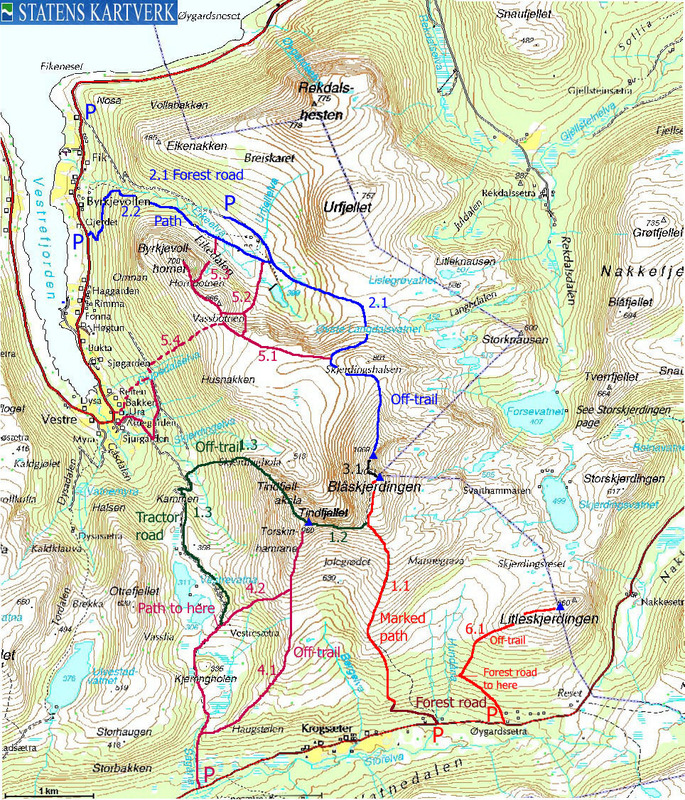 The only commonly used route that is NOT described so far, is the route from Rekdalsætra. Tindfjellet (960m) connects to Skjerdingen via a narrow and in parts - airy ridge, and Byrkjevollhornet is a small top on the northwest side of the massif. Neither tops are ranked as independent tops on this website, but nevertheless, both top surely deserve a visit. Litleskjerdingen is a lower hill that connects to Skjerdingen on the east side. Taking its primary factor into consideration, this website ranks Litleskjerdingen as an independent mountain. The Haram/Vestnes border runs across the summit ridge, and while the summit cairn is located ON the kommune border, the high point is located 77m into Vestnes kommune. Note that the 660m map point is only a viewpoint, and is NOT the summit. Blåskjerdingen (Norge 1:50,000: 1069m, Økonomisk Kartverk 1:15,000: -, UTM 32 V 383646 6942754) has a primary factor of 771m towards the higher parent mountain Trolltinden (1170m). The defining saddle (approx. UTM 32 V 392652 6938463) is found east of "Tua". Ref. Økonomisk Kartverk (5m contours), the saddle is within the range 300m-295m, interpolated to 298m. Litleskjerdingen (Norge 1:50,000: 1069m, Økonomisk Kartverk 1:15,000: 677,5m ~ 678m, UTM 32 V 385773 6941064) has a primary factor of 110m towards the higher parent mountain Blåskjerdingen (1069m). The defining saddle - Skjerdingsreset - (approx. UTM 32 V 385407 6941395) is found north of Litleskjerdingen. Ref. Økonomisk Kartverk (5m contours), the saddle is within the range 565-570, interpolated to 568m. Note that the 550m contours on the north side in the saddle is clearly wrong. The correct contour is 575m. Tindfjellet is not considered an independent mountain, with a primary factor of approx. 50m. 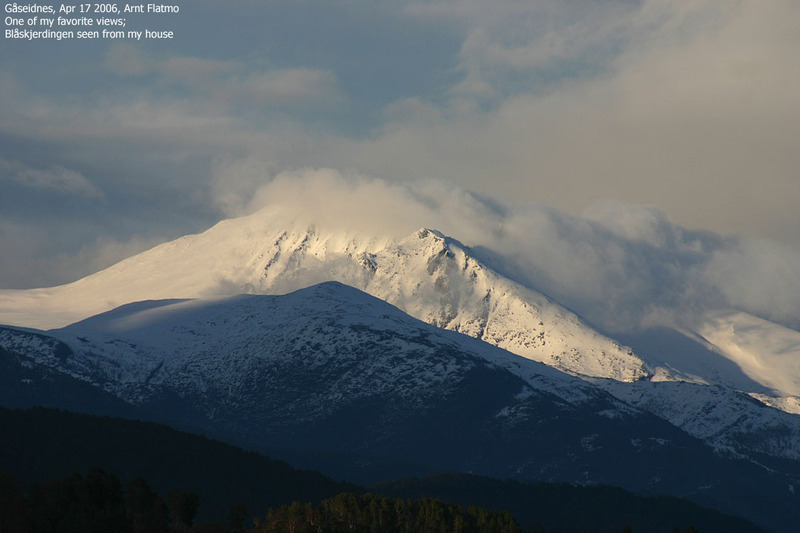 Byrkjevollhornet is not considered an independent mountain, with a primary factor of approx. 78m. The trailheads listed in this section are referred to in the route description section further down on this page. From Ålesund, follow highway E136->E39 towards Åndalsnes. From the E136/E39/Olsvika roundabout near Breivka, follow E39 approx. 13,3Km. Turn left onto highway RV661 (Skodje/Brattvåg/Vatne). After 1,5Km, pay toll at an unmanned toll booth (coins + credit cards + AutoPass). Approx. 9,7Km after you left E39, you reach the RV659 (Brattvåg)/661(Vatne) junction at Eidet. At Eidet, turn right and follow RV661 2,1Km to Vatne. Turn left towards "Vestre" and continue 16,6Km on RV661 from this junction. You are now at Byrkjevollen and you have a forest road on your right-hand side. The snow of this forest road will determine how far towards Eikesætra you get. If the road is wet, a small-size car might have problems getting up here. There is parking for a few cars at the beginning of the forest road. You also have options to park along side the road along the way. 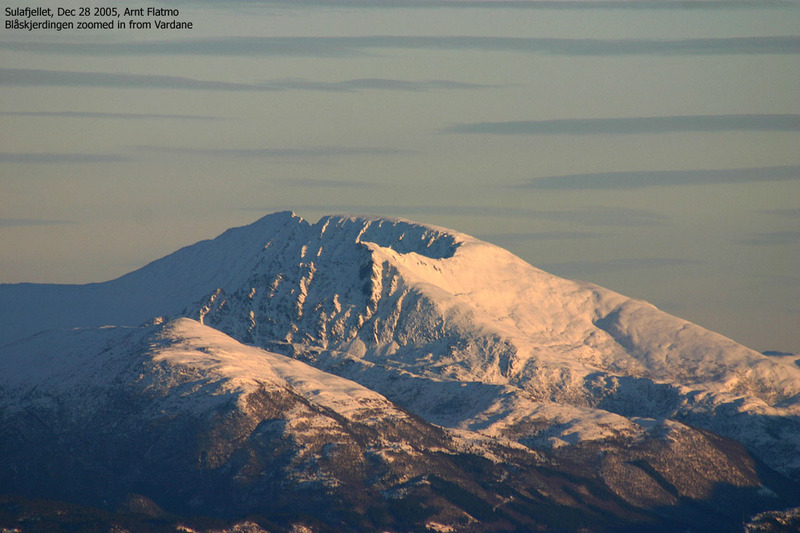 From Eikesetra, you can also visit Rekdalshesten and Urfjellet. At Eidet, turn right and follow RV661 2,1Km to Vatne. Turn left towards "Vestre" and follow the road ROUGHLY 13Km to Vestre (The distance will me measured later). Cross the river on a bridge and take the first road to your right. Find parking nearby. At Eidet, turn right and follow RV661 2,1Km to the "Vestre" junction. Stay right in this junction and continue approx. 7,3Km up Vatnedalen. You will see a forest road on your left-hand side and the "Skjerdingen" trailsign. Parking is available on the right-hand side of the road. At Eidet, turn right and follow RV661 2,1Km to the "Vestre" junction. Stay right in this junction and continue approx. 8Km up Vatnedalen (700-800m past the Blåskjerdingen trailhead). You will see a forest road on your left-hand side. Park here. At Eidet, turn right and follow RV661 2,1Km to the "Vestre" junction. Stay right in this junction and continue approx. 4,5Km up Vatnedalen. You see the "Vestresætra" trailsign on the left-hand side of the road. 3-4 cars can park by - or nearby - the trailhead. At the trailhead in Vatnedalen, a forest road forks immediately. Turn left in this fork and continue upwards. At the next fork, turn right. The forest road branch that you're on, ends at the top of the hill. Turn left and follow a path marked by red/white markers and later on, the letter "F" (Fjelltrim) painted in red on rocks. The path runs through easy birch forest, then across boggy ground before you get on boulder terrain. There is no clear path up the boulder section, which also gets steeper before you reach the flat-topped summit plateau. A huge cairn marks the top of Skjerdingen summit. 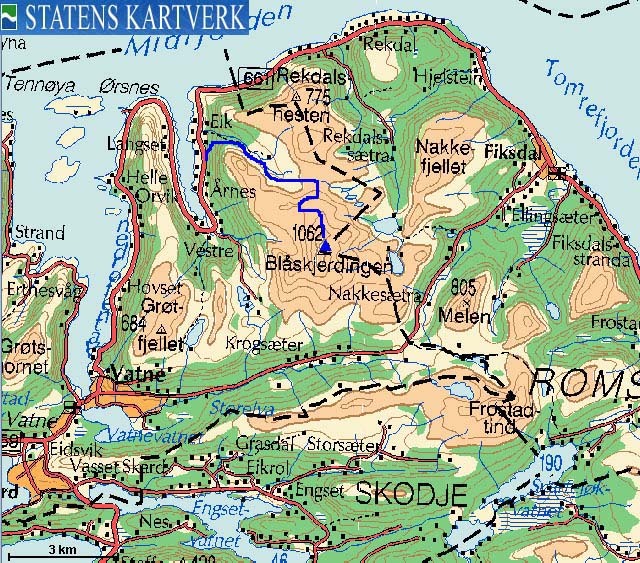 Expect at least 2 hours on this 3,7Km hike from Vatnedalen. Total elevation gain is 850m on this class 2 (YDS) route. See pictures from this route here. On your way from Vatnedalen to Skjerdingen, you have Tindfjellet in view to the west. This is the eastern part of the Tindfjellaksla ridge. The ridge is narrow at times, but for the most part trivial. 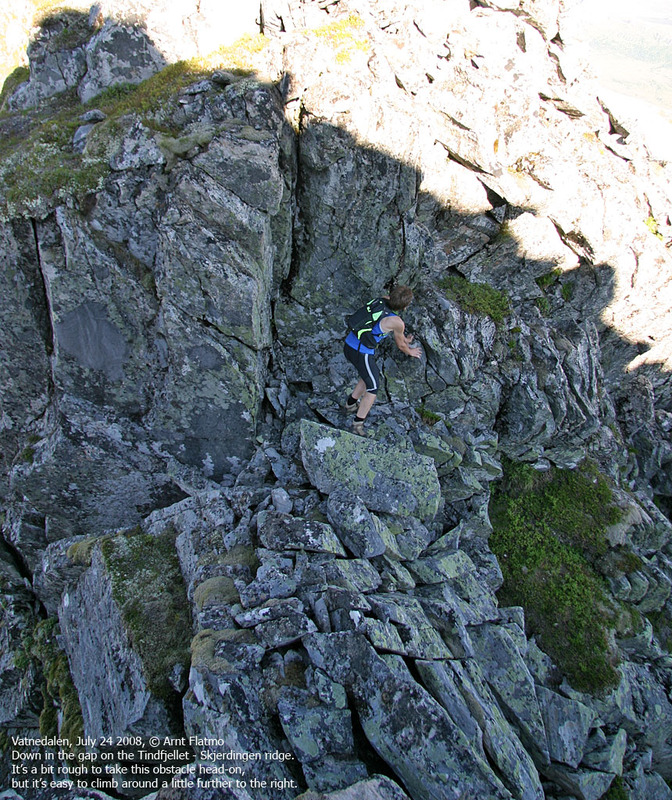 The "crux" of the route is however a gap along the ridge, and passing it involves some exposed scrambling. It is easiest to cross this ridge from Tindfjellet towards Skjerdingen. When you stand in front of the steep crag in the gap, seek towards a small ramp further to your right. Scrambling back onto the ridge is easy (YDS class 3). Finding this access point when coming from Skjerdingen is harder, and the scramble will be harder too. If you come from Skjerdingen and if it turns out that it is not straightforward for you to scramble/climb down to the gap, head back 40m, descend to the south and bypass the gap. It'll be a steep, but easy scramble back up to the ridge. The high point is marked by a tall cairn, which is located just south of the high point. See pictures from this route here and here. From Vatnedalen, follow route 4.2 to Vestresætra. Head off-trail towards Tindfjellet's south ridge where you see fit. 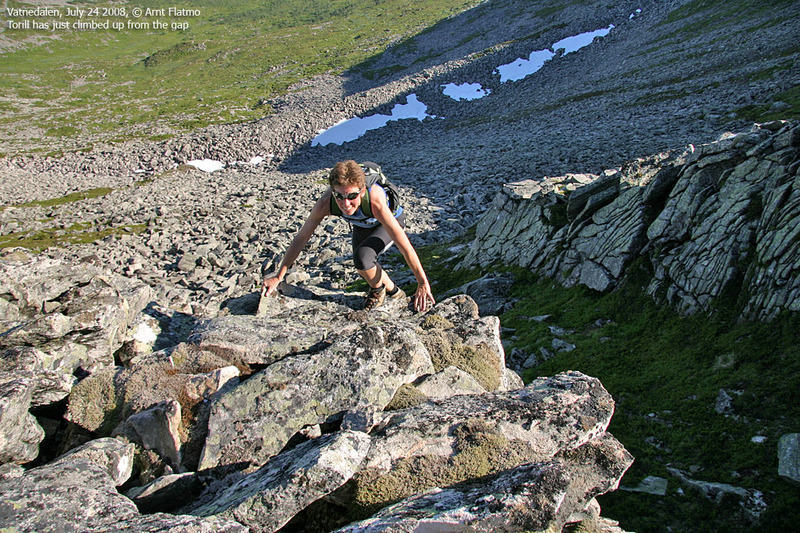 From Tindfjellet summit, descend northbound in LARGE boulder terrain. You will need to spend time on routefinding if you want to avoid amounts of scrambling this early on. Further down, the ridge becomes more distinct and number of routes get limited. Eventually, you reach an exposed saddle that connects to the northermost top on the ridge, rising up as a pillar. There is only one large, (highly) exposed, rock that becomes the real challenge. The top of the rock has a "knife-edge". It is most likely easier to climb up this rock than to climb down from it. You can bypass this saddle by descending into the nearest couloir (to the west), and head back up the first couloir coming down on your right. This couloir takes you below the pillar. Either scramble directly up (good handholds) or traverse the NEXT couloir and then walk up a small gully to the north-side of this top. A distinct crack can be used in order to avoid scrambling in order to get to the top. Moving on downhill, the next section require some routefinding in order to descend a drop on the ridge, but from then on, the ridge is trivial. Descend down to the forest and then head westbound to the forest road from Vestrefjorden, which takes you back to Vestresætra. If you parked down by Byrkjevollen, follow the forest road up to Eikesætra. Proceed up the gentle slope towards the Urfjellet - Skjerdingshalsen pass. Head steep southbound up towards Skjerdingshalsen, but turn westbound at 700m elevation to avoid the steepest section above you. Once the terrain gets less steep, head southeast towards the beginning of Blåskjerdingen's north ridge and follow the ridge all the way to the top. Expect at least 2 hours on the 4Km route from Eikesætra. Total elevation gain from Eikesætra is approx. 700m on this class 2 (YDS) route. If you parked down by RV661, the elevation gain is 1030m. There are no particular difficulties along the route. On hard snow, axe/crampons may be useful as you climb the steep hill below Skjerdingshalsen and the north ridge up to Blåskjerdingen summit. One steep section on the north ridge can be bypassed to the right. Space on top of Blåskjerdingen is limited, but not directly exposed. A cairn marks the high point. This is an alternative route up to Eikesætra, if you don't like forest roads. You will see a forest road on your right-hand side approx. 15,2Km after you turned left at the "Vestre" junction in Vatne. There is a large parking area on the left-hand side of the road. You can follow this forest road up to 110m elevation, turn left in a sharp right-hand curve and get on a forest path marked by blue poles. Follow this route northbound 500m until the route turns eastbound and heads up Eikedalen on the south side of the river. From Eikesætra, follow route 2.1 towards Blåskjerdingen. From Skjerdingen summit, head northwest until you get to a steep, but fairly straightforward slope leading down to a saddle (class 2). After crossing the saddle, scramble up a steep section (class 2+) where care is needed (especially when going down). There is even a fairly visible path here. Next, you reach a short ridge which you can pass on the right-hand (east) side. 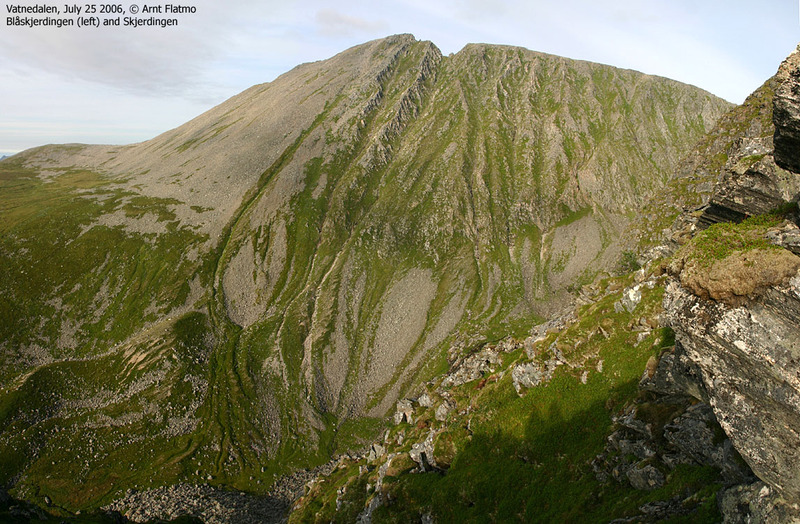 The final section is a steep and exposed scramble on firm rock (class 3), where low centre of gravity is an important key. You may very well feel that descending this route is significantly harder than the ascent. After the short ridge, you can avoid the final exposed scramble by descending down to the left (west) and bypass the cliff above you. If you follow the correct bypass route, you top out on the ridge close to the Blåskjerdingen summit cairn. Do not attempt this route if you have no experience with class 3 (YDS) routes in exposed terrain. The above route description applies for dry rock and good conditions. When the mountain is wet, slippery, icy, etc., strongly consider using a rope for this traverse. From the trailhead in Vatnedalen, follow a marked (red/white markers), narrow path up through the forest, and across a large meadow (4,2) once out of the forest. The path runs to the west of the Kjerringholen hill and ends at the Vestresætra buildings. The tractor road towards Vestrefjorden begins/ends at Vestresætra. From Vestresætra, head (off-trail) up towards Tindfjellet's south ridge where you see fit, and then up the top of Tindfjellet, marked by a tall cairn. Actually, the high point is just a little to the north of the tall cairn. Upon descent, consider following the south ridge (off-trail) all the way down (4.1) and join the path just above the forest. 5.1: From the Eikesætra trailhead, the normal skiing route to Byrkjevollhornet follows route 2.1 up Skjerdinghalsen. This ridge can be slightly awkward when there is little snow. Once on the plateau, turn west/northwest and proceed on gentle terrain to Byrkjevollhornet. 5.1: From the Eikesætra trailhead, head southbound towards a distinct "bowl" called Vassbotnen. By the look of it, you can hike up on either side of the bowl, but this route will be described in further detail, once visited. This is a summer route, as cornices may block your access in winter. 5.3: From the Eikesætra trailhead, head southbound towards a distinct "bowl" called Hornbotnen. By the look of it, you can hike up on the north side of the bowl. At least, a path runs high on the north side of the bowl. This route will be described in further detail, once visited. 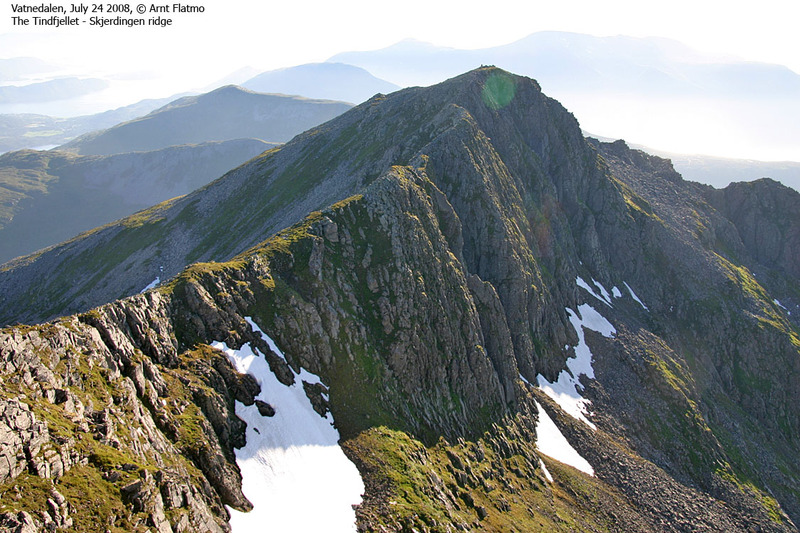 This is a summer route, as cornices may block your access in winter. 5.4: From the Vestre trailhead, follow the forest road towards Vestrevatna (and later Vatnedalen), but turn left (north) onto another forest road at 70m elevation. Cross the river and follow the road until you pass Djupedalselva river. Then turn right and go off-trail up the forest. Stay close to the river (for reference upon your descent), and avoid the boulderfields high on the mountain. You will top out in the Blåskjerdingen - Byrkjevollhornet saddle. Turn left and head for Byrkjevollhornet. You can also make a short-cut in the lower forest, for instance follow Djupedalselva from the very bottom, thus avoiding a detour along the forest road. See pictures from route 5.4 here. From the trailhead in Vatnedalen, follow a forest road 800m upwards in the northwest direction. At the end of the road, turn north/northeast and cross meadows and small birch forest until you reach Litleskjerdingen's west ridge. Follow the ridge up to the summit cairn and then approx. 77m eastbound to the (unmarked) high point.